Mahalaya marks the start of the Durga Puja festival. On this day, the goddess Durga is believed to have descended to Earth. Then the festival of Navratri comes. In the word Navratri, Nava means nine and Ratri means nights. So basically this is a nine day celebration of Goddess Durga. Hindus celebrate this with devotion and enthusiasm all over the world with full of joy and festivity. Goddess Durga is worshiped throughout the nine days and then immersed in holy water after pooja. Each and everyday has its importance and meaning. Monday is here again and this time the Foodie Monday Blog Hop team has decided the 165th theme to be 'Navratri Special'. 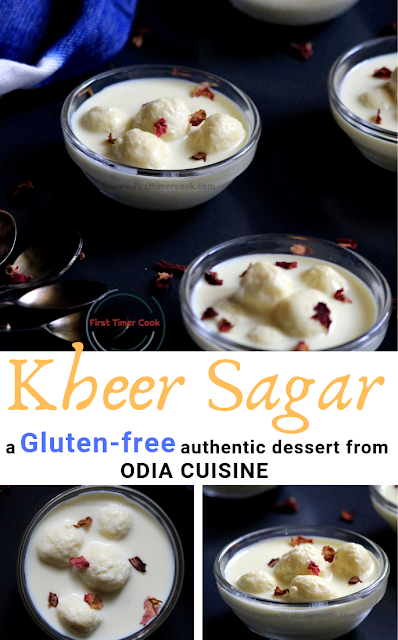 After doing a lot of brain storming, I have ended up with one of the authentic sweet delicacy from Odia Cuisine, 'Kheer Sagar' for the contribution. Kheer Sagar is an Odia word. Here Kheer means milk and Sagar means ocean. So overall the dish loaded with milk. Basically marble ball sized chhena balls are dunked in flavored reduced milk. 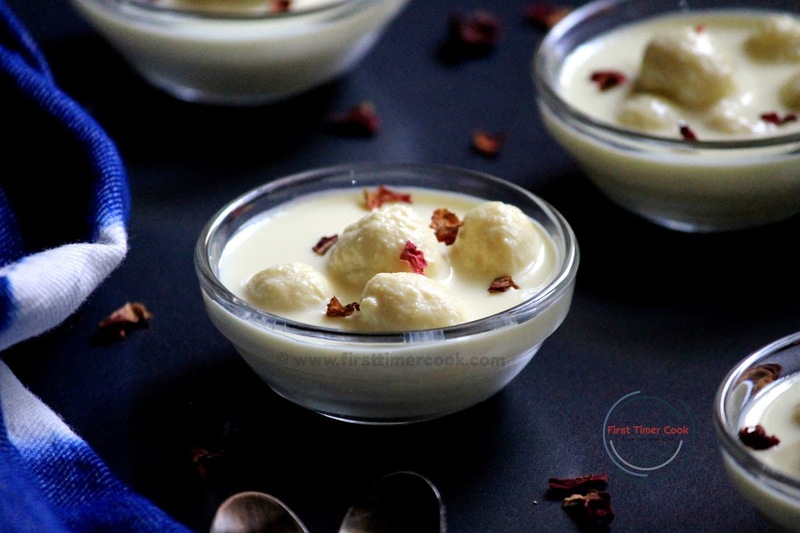 The Bengali RASMALAI and Odia KHEER SAGAR are quite similar, but there are some differences like size of the chhena balls, the consistency of the reduced milk. The consistency of milk is little thick, but not like rabdi in kheer sagar. The whole process is so so easy and quick. No dryfruits are used in this dessert unlike rasmalai. This authentic Odia delicacy is very rich and absolutely much flavorful, still so simple dish. In a wide and deep pan, first mix 3 cup water and 1 cup sugar. Then turn on heat and start boiling the sugar mixture. Take small portion of kneaded dough and roll to tiny ball (less than 1/2 inch size). The size of the ball will increase to almost double after boiling in sugar syrup, hence always remember to make the ball size as small as possible so that after boiling in sugar syrup the size will be of marble size ball. Similarly make tiny chhena balls and gently drop into the boiling syrup. Boil for 5 minutes first, then reduce the heat and allow to cook for 10 minutes more over low heat. By the time, the balls must be doubled in size. Turn off heat and allow to cool down completely. Next in another heavy bottom pan, start boiling milk. Then simmer and allow to reduce till half the original quantity, while stirring in between. Add saffron, sugar, cardamom powder and mix well. Cook till sugar completely dissolve which takes 1-2 minutes approximately. 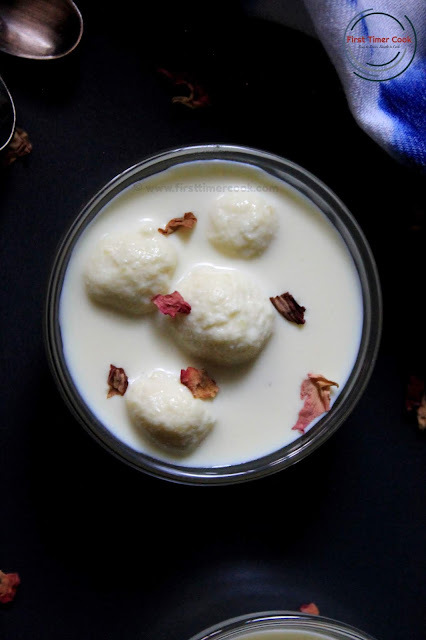 Now squeeze all the tiny rasgullas gently and drop into the reduced milk. Stir carefully so that the rasgullas don't break. Cook for 1-2 minutes and then turn off heat. Allow to cool completely and then keep in refrigerator. 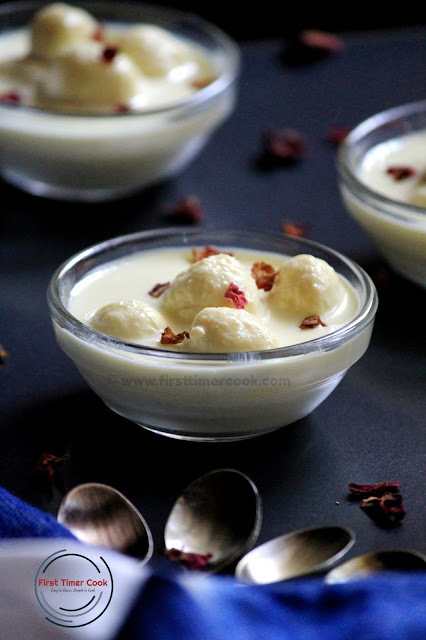 Finally sprinkle some dried rose petals and serve this authentic Odia dessert Kheer Sagar chilled ! Always prefer to use fresh chhena for this kheer sagar. Full fat milk will make the whole dish even more rich and delicious. So try to include full fat milk instead of normal one. 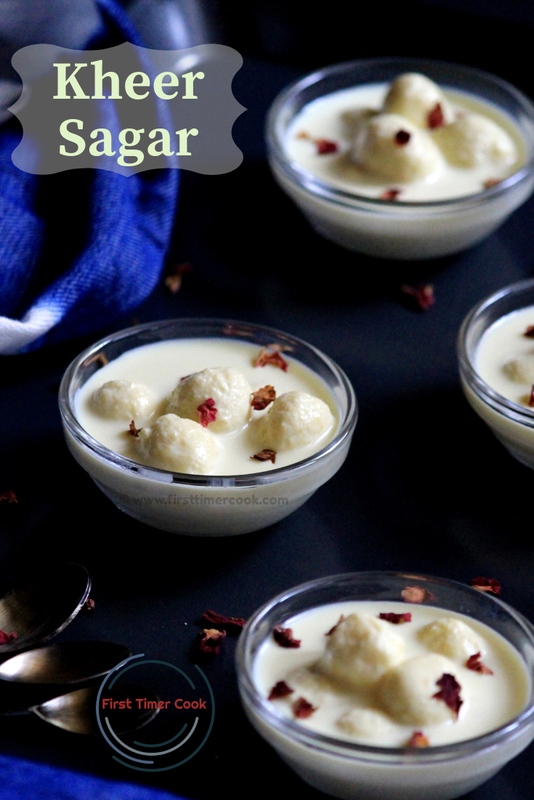 Kheer sagar looks delish Sasmita. Perfect share for the Navratri theme. I can imagine the heavenly taste and flavour. Lovely share. Stunning Dessert for Navratri. I wouldn't mind eating bowlfuls of these considering how hot Mumbai is right now. Loved the recipe and the beautiful pictures. This dessert looks absolutely stunning .. Completely new for me..i must try..